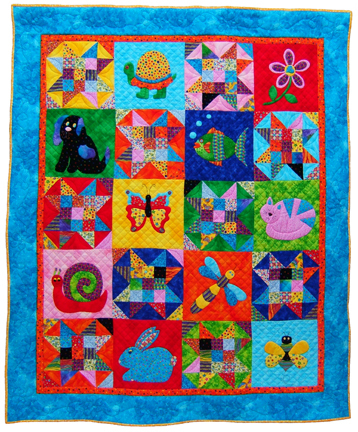 Quilt measures 61" x 73"
Make this lovely quilt for a special child and watch their eyes light up at the wonderful animal and flower appliqués. Make this quilt in bright colours and use flannel fabrics to make this quilt very snugly. With big appliqué pieces, this is a good project to practise your appliqué skills. This pattern includes full sized patterns and full instructions for hand applique and would be suitable for any skill level.